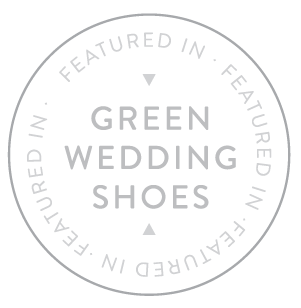 As seen on June Bug Weddings! 2017 Wedding Trends! 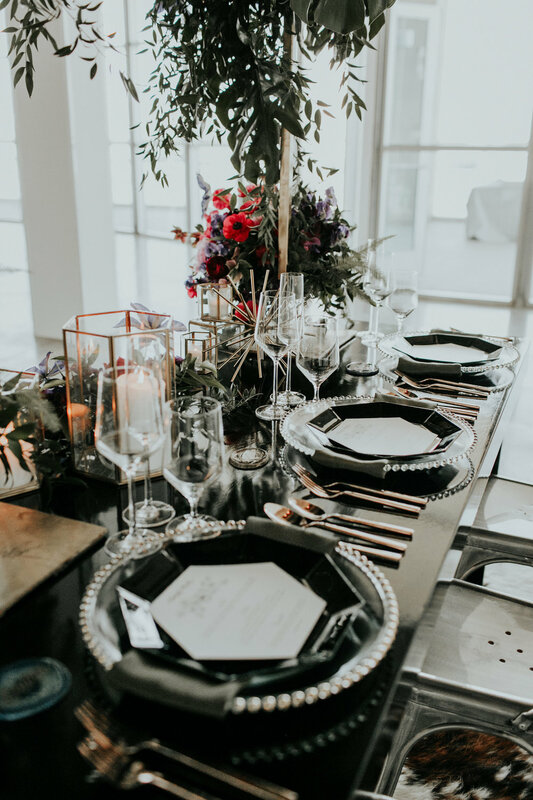 We are loving all the newest eye catching movement of color and sophistication coming in to the wedding fashion and design world this year... and this was our chance to show it off!! We noticed a new venue opening up call "The Modern". Located on a private airport in Long Beach, California, we wanted to seize the opportunity to show off its polished concrete floors, marble bar tops and its stunning 16 foot chandelier made up of over 300 glass orbs! 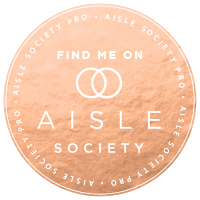 So exciting to have such a beautiful space brand new to the Orange County and Los Angeles wedding market. We started the day off as any bride would with hair and make up and all things beautiful! 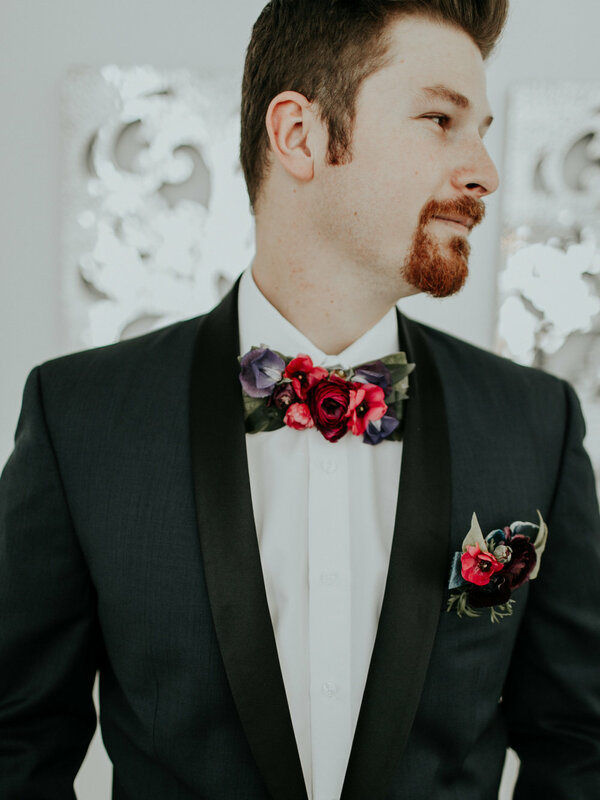 The groom boasted a fabulous, two toned, dark blue and black suit. Complete with a floral bow tie made of flowers to match his pocket square, he looked dashing! 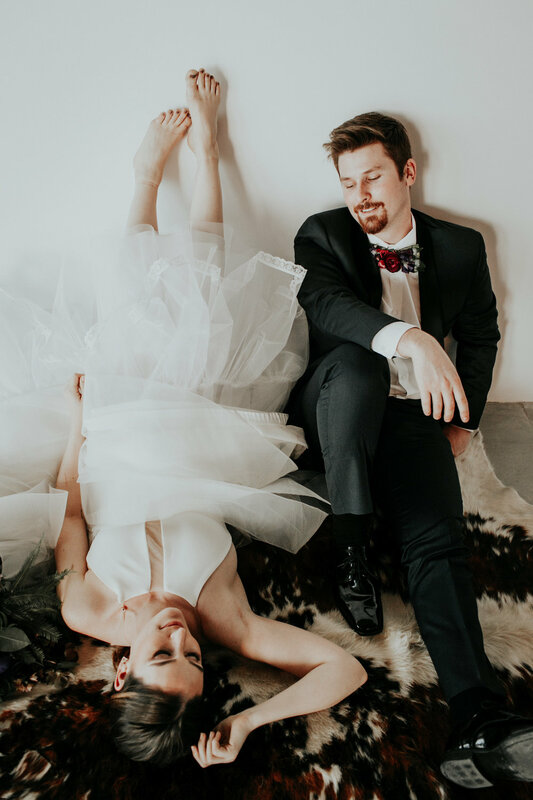 The couple got dressed in the couples suite upstairs and gazed out as they watched thereception space come to life with all of our fun design ideas. My personal favorite was cake wall, because who needs a dessert table when you can have a whole wall, but seriously!!!!! We worked our way through all our favorite places in the venue. A grand staircase, a patio to watch the planes come and go and even their second story wine cellar. Truly a fabulous way to start off a great wedding season! The bride and groom featured in our shoot, Elle & Ryan, are currently engaged and have a wedding planned for Memorial Weekend 2018. The Elle told us the number one thing she learned was how heavy the bouquet was and that she would need to start an arm work out to make sure she could hold onto hers all night.